Early map of Ohio and Indiana. 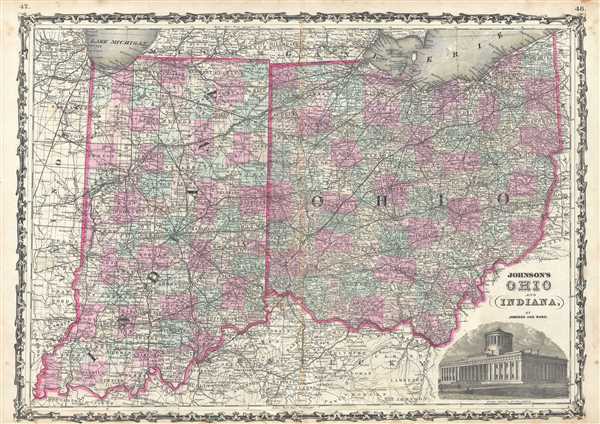 This is Johnson and Ward's 1863 map of Ohio and Indiana. Covers the states divided into counties with special attention to transportation, especially roads, railroads, and canals. There is an engraved view of the Ohio State Capitol Building at Columbus in the lower right quadrant. Features the ribbon style border common to Johnson's atlas work from 1860 to 1863. Steel plate engraving prepared by A. J. Johnson for publication as plates no. 47 and 48 in the 1863 edition of his New Illustrated Atlas…. Very good. Some toning along original centerfold. Exhibits foxing at places, especially over margins. Minor rip near bottom centerfold, repaired on verso. Rumsey 2905.023 (1860 edition). Phillips 6140.36-37 (1860 edition).